A solid technical foundation on Cloud Computing was developed over the last years ranging from resource allocation on the Infrastructure as a Service (IaaS) layer, job and application execution on the Platform as a Service (PaaS) layer, to software and service usage on the Software as a Service (SaaS) layer. This foundation allows the access of resources according to the pay-as-you-go principle. At this, the resources are located in datacenters provided by companies all around the world and users can access them remotely without the need for any upfront capital expenses, long-term commitment, or significant provisioning delay. However, this cloud concept brought many new challenges with respect to Service Level Agreements, Software-defined networking, Energy awareness, Scalability, Availability, and Reliability. 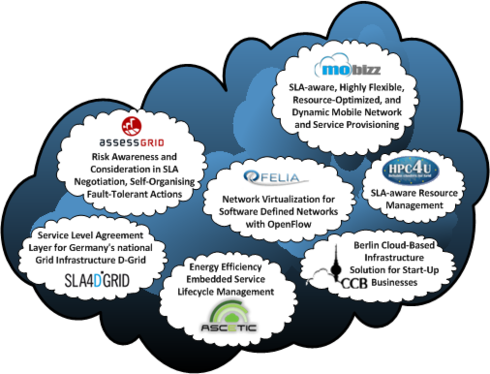 Our group manages more than three computing clusters to conduct state-of-the-art research for highly-optimized cloud infrastructures. The biggest cluster consists of 200 nodes and is used for cloud computing research, focusing on scalability of algorithms and system management procedures. Two currently running projects make use of a smaller cluster compound of 16 cluster nodes. We prosecute energy-meters to capture the individual power consumption of each cluster node. 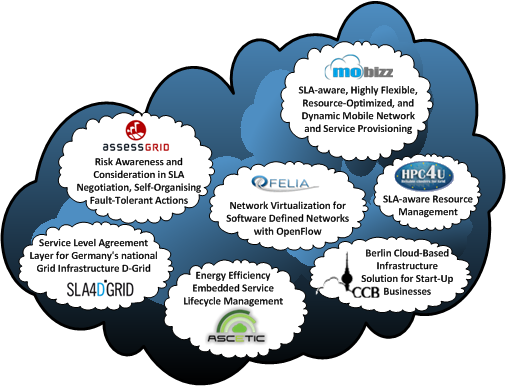 In the ASCETiC project, we use this cluster to improve energy-efficiency of cloud services. It is also available for young start-ups of the TU Berlin in terms of the CCI project. We use OpenStack to manage this cluster's infrastructure. A third cluster consists of nearly two terabytes of RAM and was primarily used in the EC-funded EFRE project. It consists of ten cores with two six-core CPUs in each. Service Level Agreements (SLA) are established and managed between Cloud Service Provider and Cloud Service Consumer and are an instrument to describe a service and its quality. This topic is of crucial importance for companies whose success is depending on the advertised Quality of Service (QoS) that the service provider delivers. Thus, an innovative way have to be found for SLA management and monitoring of guarantee fulfillment comprising agreement template definition, agreement negotiation, agreement creation and of course the validation and evaluation of agreements. The work group of Complex and Distributed Systems (CIT) strongly conduct research in this domain which is exposed by the successful projects listed below on the one hand and is reflected in the high number of research papers on the other hand. Furthermore, we delivered not only the Web Service Agreement Negotiation (WS-Agreement Negotiation) specification in cooperation with the Open Grid Forum (OGF), but still working also on the Web Service Agreement Framework for Java (WSAG4J).